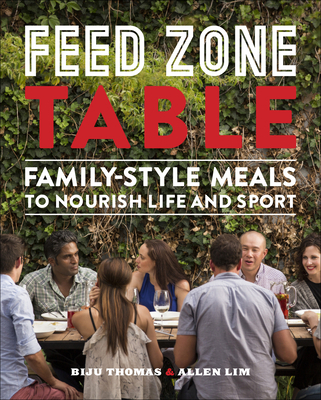 In their third cookbook, Feed Zone Table, chef Biju Thomas and Dr. Allen Lim offer over 100 all-new recipes to bring friends and family to the table in a way that nourishes life and sport. Feed Zone Table will inspire your family-style dinners with a delicious line up of drinks, starters, main courses, side dishes, fresh sauces, and desserts. Biju rolls out easy techniques for making flavorful food that's fun to prepare and share. Enjoying dinnertime and eating well will nourish you, your family and friends--and your sports performance. Science shows it's not just what we eat that matters; eating together matters, too. Dr. Lim saw these benefits first-hand while working with professional athletes and shares new research on how social meals benefit everyone. Lim reveals why it matters--what science has to say about food, camaraderie, performance, and the pivotal role that the dinner table can play in an athlete's preparation. Sports are often an escape from life, but Feed Zone Table is a warm invitation back to the table. We perform best when we nourish our bodies and feed our souls. Bring great food and people together with Feed Zone Table and you'll feel the difference. Dr. Allen Lim and chef Biju Thomas are authors of the best-selling Feed Zone Series of cookbooks including The Feed Zone Cookbook, Feed Zone Portables, and Feed Zone Table.Chef Biju Thomas is a professional chef known for light, simple dishes bursting with bold flavors. He has designed the menus of many successful restaurants in Denver and Boulder, Colorado and has launched his own restaurant, Biju's Little Curry Shop, in Denver's up-and-coming RiNo neighborhood.In 2009, Chef Biju teamed up with sports physiologist Dr. Allen Lim to improve the everyday diets and performance nutrition of professional cyclists and their teams. In the years since, Chef Biju has cooked for dozens of elite professional cyclists, teaching them the craft of cooking. His Feed Zone series of books with Lim, The Feed Zone Cookbook and Feed Zone Portables, feature 225 easy, healthy recipes and snack ideas for an active lifestyle. Biju has been a chef for pro cycling teams and coordinated food for one of the sport's biggest races, the Tour of California. Biju has also been the chef for the Dempsey/Del Piero Racing, a Grand-Am and Le Mans motorsports team. He also contributes recipes to Skratch Labs, Omega Juicers, and Map My Fitness. Dr. Allen Lim is a sports physiologist, cycling coach, and a founder of Skratch Labs, a manufacturer of performance hydration mixes and the world's first active nourishment company. Beginning his coaching career with Jonathan Vaughters' TIAA-CREF cycling development team, Lim developed a method of testing for biological markers of performance enhancing drugs that led to cycling's Biological Passport. Lim was director of sport science for Garmin and RadioShack professional cycling teams and is the only American scientist to have worked and cooked for teams at the Tour de France. Lim has worked with dozens of top American cyclists to improve their performance and nutrition.